1. 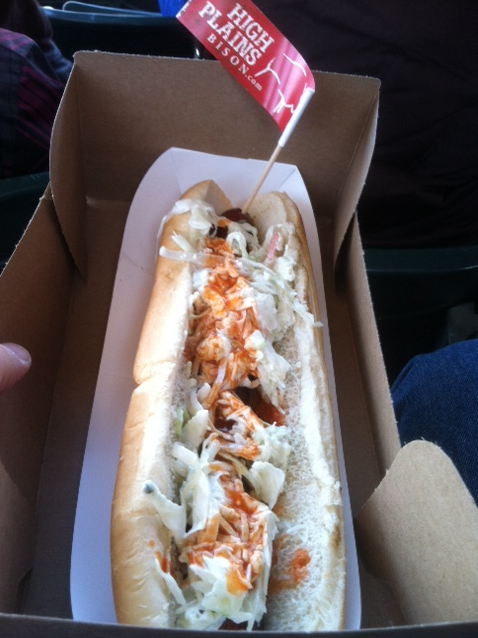 Beachwood Cubs correspondent Marty Gangler attended the game Monday night at Wrigley and sent us this photo of the footlong bison dog blue cheese slaw. Of course, we had to ask him if that was the bison footlong on his lap or if he was just happy to see us. He said it was the bison. 2. "Corey Patterson laughs at being called one of the old guys," the Tennessean reports. "But the truth is the 32-year-old outfielder already has proved a lot, even if he's not really old. He has 118 big-league home runs over parts of 12 seasons in the majors to go with 218 career big-league stolen bases. "Last season, he picked up a World Series ring with the St. Louis Cardinals. "When the [Nashville] Sounds begin their season Thursday in New Orleans, it's Patterson's chance to show the Brewers he's still got what it takes. "In the meantime, he hopes to make the best of playing with what looks to be a pretty promising Triple-A club, helping out younger players when he can." 3. Eight Reasons Dusty Baker Is On Thin Ice To Start 2012. 4. "Marlon Byrd is more Jacque Jones or Chris Singleton than he is Ernie Banks in the pantheon of Chicago ballplayers, but he claims a singular distinction as the 2012 season gets under way," Dan McGrath writes for the Sun-Times. "Byrd, a 34-year-old center fielder, was the only African-American player on the Cubs' or White Sox' Opening Day rosters." 5. "In 1988, I got my first job that paid real money and found out, much to my surprise, that I could afford to take 20 of my friends to a weekend Cubs game at Wrigley Field," Art Golab writes for the Sun-Times. "The cost: $84, less than a day's pay. That's all it took to buy 21 tickets for bleacher seats at $4 apiece. Everybody had such a good time that we did it again the next year. "Nowadays, if I still had 20 friends to take to a ballgame - say Sunday's game vs. the Washington Nationals - picking up the tab would cost me $567, considerably more than a day's pay. "Bleacher seats for Sunday afternoon's game were 'dynamically priced' at $27 earlier in the week. "This dynamic pricing is a new twist the Cubs are trying out this year with bleacher seats only. It means the prices will vary with demand and can change like airline tickets. Assume that I locked in those bleacher seats for Sunday's game at $27. Even allowing for inflation, that would be a 250 percent increase over the $4 I paid in '88." 6. In USA Today's "Big Money Busts Dunn, Soriano, Zito Aim For Revival," our favorite left-fielder whines his way further into our doghouse. "It's tough, just so tough," says Alfonso Soriano, who signed an eight-year, $136 million contract in 2007, largest in Chicago Cubs history. "I'm the same guy. It's the same game. But it's so different. All people see is money and not the talent and work you put into it. No matter what you do, all they talk about is the contract. The most fun I ever had in baseball was when I was with the Yankees. I was making $600,000, and just enjoying the game. Here's an idea, then, Alfonso: Make yourself and a helluva lotta Cubs fans happy again by renegotiating your earnings back to their glory years. We'll even adjust for inflation. "I'm not frustrated, but this is not fair." Soriano's on-base percentage has dropped from .351 in 2006, his only year with the Washington Nationals, to .289 in 2011. 7. So both of the Maddux brothers lied. 8. Maybe Alfonso Soriano oughta lend the Peoria Chiefs a hand. 9. "Guillen will be eligible to return from the suspension on Tuesday, April 17, when the Marlins host the Chicago Cubs." 10. The Idaho Cubs prepare for their future.